Are you interested in learning how to stop coughing at night narurally? See, the fact of the matter is that coughing that is persistent through the day or night is among the most common symptoms amidst people who suffer from asthma. However, using one breathing technique, which is known as the Buteyko Emergency Procedure made it possible for over a quarter of a million of asthmatics to become symptom-free naturally, and stop persistent coughing fit at night nearly instantly. Believe it or not, this simple technique can help you put an end to bouts of persistent coughing (along with dry cough fits) the natural way, and even fall asleep fast. More than 170 MDs in the USSR and Russia have been using the Buteyko breathing method for over 50 years. They made it a point to teach this exercise to all of their patients who suffer from conditions like cystic fibrosis, COPD, asthma, bronchitis, emphysema etc. It is also meant to help people learn how to stop coughing at night. It works wonders in terms of putting an end to an excessive or severe cough fit, dry cough at night, nagging bouts of coughing etc. Whenever you cough, you end up breathing nearly 3-5 times more air than the medical norm. This activity is commonly known as ‘hyperventilation’. 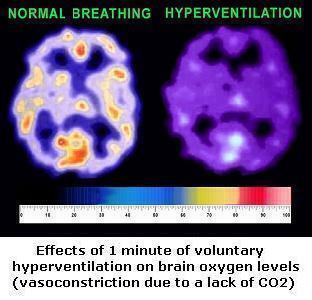 Also known as overbreathing, hyperventilation has the potential to reduce oxygen levels in the brain, heart and just about all other vital organs. It is for this reason that coughing is known to promote chronic diseases including COPD, cancer, asthma, heart diseases, diabetes, and many others. Basically, you need to maintain this comfortable level of air hunger for a while, till the time that you fall asleep. Remember, you need to create air hunger here by breathing less. This technique is also one of the fastest ways to fall asleep naturally, and has additionally helped countless people suffering from severe cough, dry cough, and constant cough (along with bronchitis, asthma, COPD, cystic fibrosis, emphysema etc.). During the day, you may perform the same breathing exercise in order to cut down on the duration of your coughing fit. It can help reduce these by nearly 3-4 times. On the whole, you would be able to put an end to your problems with persistent or chronic coughing by simply slowing down your automatic breathing to the medical norm, and achieve more than 20 seconds for the body-oxygen test 24/7. The YouTube video given below explains the same breathing exercise. For clarification purposes, make sure that you check it out. Can’t stop persistent coughing at night? Follow these steps! With all that in check, relax all of the muscles of your body while lying down in bed on your left side or tummy. Now, pinch your nose a little and hold your breath till the time that you start feeling a bit of discomfort. In case you are finding it hard to hold your breath because of not being able to stop coughing, cough only via your nose, and inhale through it as well. After holding your breath, take a very small inhalation (just a sniff), that too via the nose. If your cough is persistent, make sure that your inhalations and exhalations are limited, whereas you may only cough through your nose. Once you have taken this short inhalation, relax all of the muscles of your body, particularly the upper chest and shoulders to be able to exhale slowly for it needs to be unforced and natural. Now, take another small inhalation, and relax completely in order to exhale. With every breath that you take, you must only take a small inhalation, and then relax completely (even though you have a cough). The basic aim here is to gently create air hunger, all the while relax the muscles of your body. Soon, you are going to start experiencing light air hunger. All through this reduced or shallow breathing exercise, it is normal for your breathing to be frequent.